Making money online attracts me a lot and there are several reasons for this, first of all, I have success with it, that is why I run this blog, in order to help you start with making money from home. All my articles are written spontaneously – whenever I find and test a great way of making money on the web, I start creating a new post for my readers, but sometimes visitors of IncomeBooster.org ask me questions about working from home and I answer them with pleasure. The idea of this blog post was prompted by one question about earning with micro job websites, or sites sites like microworkers, so today we are talking about getting paid for freelance work and possibly reviewing an alternative to MicroWorkers.com and Amazon Mturk. If you are not familiar with websites, which pay money for completing various freelance jobs, I highly recommend to check out my posts about data entry and freelancing (these will give you a general idea of what I am driving at). Micro Workers and Mturk are two websites, which could be called trend-setters in this make money online niche, but I have to admit and new strong player got visible on the horizon and it is called MicroJob.co. MicroJob.co is not just a micro jobs website, where freelance workers can make money by completing quick and easy tasks, but a fully operating paid social network, here users communicate, share their thoughts and discuss the latest news work from home news and make money online techniques. 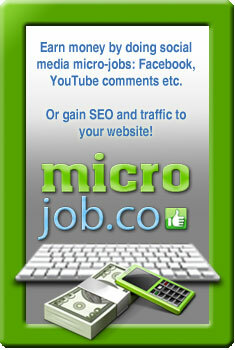 The registration about MicroJob is totally free and takes only several seconds to accomplish. After registration you will be able to browse available jobs (currently there are 101 job listing available). By the way, here you can get money for completing such simple tasks as: content writing, video editing and creation, social bookmarking, blog/video commenting, video uploading and distributions and many more. Furthermore, you can participate in their unique referral program and get $1 for every active users, who creates at least one campaign. How much can we earn with MicroJob.co? With MicroJob.co you can forget about penny tasks and get good money for your work, every completed task would add $0.2-$4 to your account balance and usually such freelance jobs take 2-5 minutes to accomplish. Personally, I have made 9 dollars in fifteen minutes at MicroJob.co and will go on promoting this website, provided I would like to take full advantage of their referral bonus program. I can tell that this is a great alternative to microworkers.com. Micro Job offers tons of other interactive services and options, register today to find out how easy online money-making could be. The only disadvantage of this freelance job marketplace is a high withdrawal limit, which is set at 25 dollars, but still it is reachable, as for me. Supported cashout systems are PayPal and MoneyBookers, which are secure and easy to use. Thanks for reading, I do hope that you found this article helpful and will start to make money with freelance tasks. If you have questions about this freelance job website or would like to learn more about work from home opportunities, leave me your comments or questions. Finally, feel free to subscribe to IncomeBooster.org (free Internet business news will be emailed to your for free). why I can not acces microjob.co site ? Their site is really down, but I don’t know possible reason yet.